Should you wish to cancel hosting accounts using WHM, you’ll find a convenient option available to terminate one or more accounts as a batch. 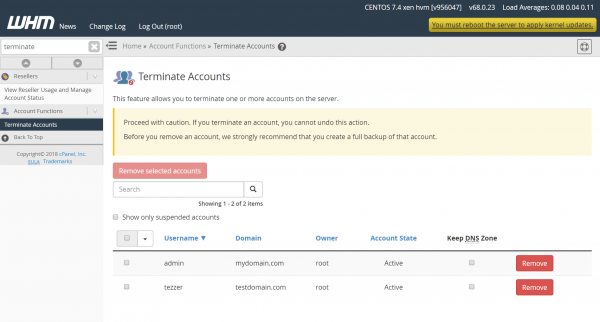 Follow these steps to terminate multiple accounts via WHM. Log in to the WHM administration dashboard. 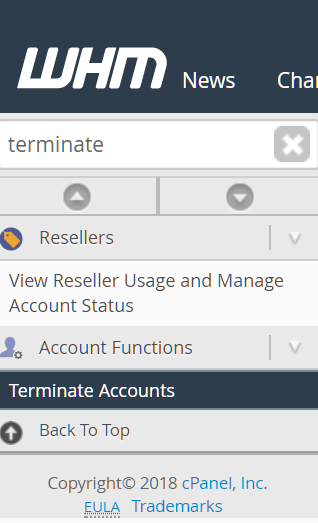 In the search box, enter “terminate”, then select Terminate Accounts under Account Functions. A list of existing accounts will be displayed on screen. Check the accounts you wish to terminate and click Remove selected accounts. Note the Keep DNS Zone checkbox adjacent to each entry which is available if you wish to keep the DNS records associated with the accounts. To complete account deletion, click the Yes, remove the selected accounts button. You’ll receive a confirmation message on screen when the accounts have been deleted.